Stscherbakiwskyj, Wadym [Вадим Щербаківський] – archaeologist, ethnographer, art historian; born on 17 March 1876 in the village of Shpychyntsi (Ruzhyn raion, Zhytomyr oblast, Ukraine; at that time – Skvyra county, Kyiv gubernia, Russian Empire); died on 18 January 1957 in Brighton, England, United Kingdom; buried in Gunnersbury Cemetery, London. Stscherbakiwskyj began his secondary education in Kyiv and completed it in 1895 in Nizhyn, after which he studied at the Universities of Saint Petersburg and Moscow. From 1902 to 1906 he studied at the University of Kyiv, where he graduated from the Faculty of History and Philology and also took a course in the History of Art. In the spring of 1907 he was arrested and imprisoned for involvement in the Ukrainian national movement. In December of the same year he was released and ordered into exile. He moved to Lviv, where he was invited by Metropolitan Andrei Sheptytskyi to join the staff of the museum of art and antiquities founded by the latter in 1905. He conducted fieldwork in southern Galicia, Bukovyna and Transcarpathia, studying the traditional way of life, customs, folk dress and architecture of the various regions, and collected many valuable artefacts for the museum. In late 1910 he returned to Kyiv. From 1912 to 1922 he was director of the Archaeology department of the regional history museum in Poltava. In 1917 he became rector of the Ukrainian Popular University which was established as an adjunct to the museum. In 1922 he left for Prague where, until 1945, he was professor of archaeology at the Ukrainian Free University (UFU). During this time he was also vice-dean or dean of the UFU Faculty of Philosophy and professor of archaeology at the Ukrainian Higher Pedagogical Institute. 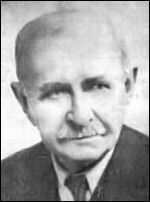 In 1923 he co-founded the Ukrainian Historical and Philological Society. In late 1945 he left for Germany where he played the leading role in the revival of the UFU in Munich. From 1945 to 1947 he served as the first rector of the revived university, and subsequently became its pro-rector (1947-1948), then dean of the Faculty of Philosophy (1948-1951). After relinquishing his position as head of the university in 1947, he concentrated on scholarly projects at the Ukrainian Free Academy of Sciences and the Shevchenko Scientific Society (of which he was elected a Full Member in 1930). He also revived the Historical and Philological Society and pursued his own research interests. On 20 September 1951 he moved to London, in order to study the valuable material on Ukraine held in the then Library of the British Museum (now the British Library). While living in England he was supported by the Association of Ukrainians in Great Britain. From March 1952 to August 1953 he was vice-chairman of the Relief Board for Ukrainian Students in Great Britain. He frequently contributed articles to the Vyzvolnyi Shliakh (Liberation Path) journal. In the meantime he continued his scholarly work on ethnography, folk customs and art. In particular, he continued to work on his book on the architecture and ornamentation of Ukrainian folk dwellings, for which he had assembled 50 coloured paintings by various artists and 20 photographs, a collection covering three generations of artists. In 1980 the AUGB arranged the publication of the book, under the name Ornamentatsiia ukrainskoi khaty (Ornamentation of Ukrainian Folk Dwellings). At the end of his life Stscherbakiwskyj lived in a care home in Brighton. Stscherbakiwskyj wrote around 100 scholarly works, including: Derevliani tserkvy na Ukraini i yikh typy (Wooden churches in Ukraine and their typology; Lviv, 1906), Arkhitektura u rizhnykh narodiv i na Ukraini (The architecture of various peoples and in Ukraine; Lviv-Kyiv, 1910), Ukrainske mystetstvo. I: Derevliane budivnytstvo i rizba na derevi (Ukrainian arts. I: Wooden architecture and wood carving; Lviv-Kyiv, 1913), Osnovni elementy ornamentatsii ukrainskykh pysanok ta yikhnie pokhodzhennia (Principal elements of the ornamentation of Ukrainian pysanky and their origins; Prague, 1925), Ukrainske mystetstvo. II: Bukovynski i halytski dereviani tserkvy, nadhrobni i prydorozhni khresty, fihury i kaplytsi (Ukrainian arts. II: Wooden churches, grave and roadside crosses, statues and chapels in Bukovyna and Galicia; Kyiv-Prague, 1925), Trypilska kultura (Trypilian culture; Prague, 1941), Kamiana doba v Ukraini (The Stone Age in Ukraine; Munich, 1974), Pamiati Vasylia Hryhorovycha Krychevskoho (In Memory of Vasyl Hryhorovych Krychevskyi; London, 1954), Zhyttia i dialnist Oleksandra Antonovycha Koshytsia (The Life and Work of Oleksandr Antonovych Koshyts; London, 1955), Ornamentatsiia ukrainskoi khaty (Ornamentation of Ukrainian Folk Dwellings; Rome, 1980), Ukrainske mystetstvo: Vybrani neopublikovani pratsi (Ukrainian arts: Selected Unpublished Works; Kyiv, 1995), Arkhitektura na Ukraini (Architecture in Ukraine; Poltava, 2006). Stscherbakiwskyj’s archival legacy is dispersed between Ukraine and other countries. He left part of his archive and collection in Kyiv with his brother Danylo Shcherbakivskyi (archaeologist and museum curator). After the latter committed suicide in 1927, Wadym Stscherbakiwskyj’s letters and other belongings, which had been deposited in the museum of the Kyiv Pechersk Lavra, disappeared. Stscherbakiwskyj left artefacts from his archaeological excavations, as well as notes, drawings and plans, and part of his collection of photographs and negatives, in the regional history museum in Poltava. This material was dispersed and partially destroyed by subsequent museum authorities. Stscherbakiwskyj’s archive and photographic collection from 1922-1945 remained in Prague when he left the city after it was occupied by Soviet forces. After the end of the Second World War the archives of various Ukrainian émigré organisations and of individual emigrants were transferred to the USSR as a ‘gift’ from the Czechoslovak government. They were subsequently placed in special sections of state archives in Moscow, Kyiv and other cities. Part of Stscherbakiwskyj’s collection has remained in the State Central Archive in Prague (Ukrainian Museum in Prague collection). Documents relating to Stscherbakiwskyj’s life and work after the Second World War, his personal effects, correspondence, manuscripts, photographs, etc, are held at the Shevchenko Library and Archive in London. They are gradually being analysed and prepared for publication.